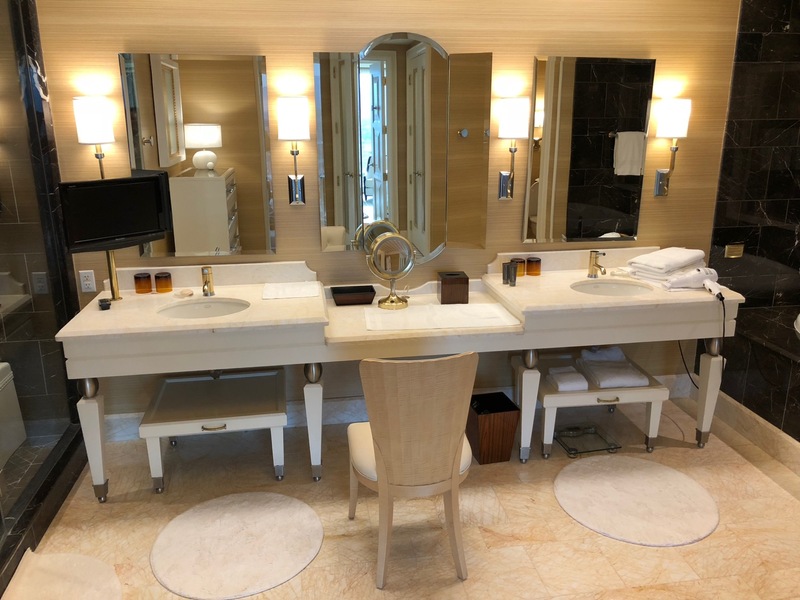 My stay in a 1,817-square foot Salon Suite a the Wynn in Las Vegas made a routine business trip much more pleasant. I wrote about how I upgraded here. This review will focus on the suite and hotel amenities. John, my business partner, arrived at the hotel a day before me so I cannot comment on the quality check-in experience. I will note that the hotel has a special entrance and check-in area for Tower Suites. Our suite was located on the 38th floor. As you walk into the suite, you are met with a large living room with two full-size couches, mirrored ceilings, a bar, a dining room table, and desk. Just past the entrance, a door on the left opens into a guest bathroom (no shower) and a door on the right opens into a massage room. For a pretty penny, the hotel will send up a masseuse to your room. The bedroom contains a single king bed with excellent bedding as well as two chairs and a dresser. The master bathroom is huge, with two closets, dual vanities with plenty of counter space, another dresser, separate water closet, large tub with jets, and a huge walk-in shower. Since we booked with the American Express Fine Hotels & Resorts program, a daily $85 breakfast credit was included. Frankly, that’s not enough at this five-star hotel. Las Vegas used to be the place to go not just for cheap hotels, but cheap food as well. Not anymore…at least at the Wynn. Breakfast ran about $115/day for two and it is not like we overindulged. Cold-pressed juices are highly recommended..both the green and red…and the cappuccino was excellent. One morning I had pancakes, the other morning I had a delicious southwestern omelet. John had oatmeal all three mornings. Room service is available around the clock. On my first night, I had arisen at 4am to catch a 6am flight from LAX to LAS, worked the entire day, and finally finished around 10pm. I was too tried to go out and just ordered a steak with soup and salad delivered to the room. The food itself was good. My filet came medium-well when I ordered it medium-rare, but I was too tired to send it back and it still tasted great. Once all the fees, taxes, and gratuity were added, my dinner bill jumped from about $60 to $100. Thus, I don’t recommend room service unless you like throwing away money. I should have gone out…I was just so tired. Of course the hotel has several beautiful pools, but they were so crowded and it was so hot, I did not visit them. My skin cannot take scorching 110ºF heat. Our AMEX package also included $100 in spa credit. The cheapest spa package was well-over $100, but I used the credit to buy $40 passes to the spa area. I very much enjoyed the tranquil setting, which included a sauna, steam room, whirlpool, and relaxation area. Sorry I don’t have more pictures, but I was lucky to sneak these two below during a brief period when I had the place to myself. Photos are forbidden inside this area for obvious reasons…everyone is in some degree of undress. The relaxation area includes soft drinks, water, fruit, almonds, and chocolate-covered cranberries. Obviously, the hotel also has a beautiful casino. Since I do not gamble (in that way at least…), I cannot offer any commentary other than there were a lot of people smoking and I could not smell it: the air ventilation system works. One of my salesman lost $60 in five minutes at the craps table…a wonderful demonstration of why I don’t gamble. Valet and self-parking are complimentary for hotel guests. On our way out, we did wait about 20 minutes for the car. While you are waiting for your car, there is a nice air conditioned sitting area just inside. One final note on security. It does appear the hotel takes security very seriously. One morning as I walked down the hall a uniformed employee with a bomb-sniffing dog walked by me. I asked if this was something new as a result of the Mandalay Bay tragedy and was told no, the K9 has been patrolling for explosives (and drugs I suspect) for many years. To be quite frank, Vegas is not my favorite city…not by any stretch of the imagination. But I appreciated this hotel very much, especially the upgrade, and highly recommend it. In terms of luxury, it did not disappoint. please please take us with you….we can comb your hair or whatever the Wynn does not do, we plus i former U. S. Navy Wave. Therefore , we will provide all security . My husband is an expert in the knowledge firearms. What do you mean “stage out” review? I absolutely loved this honest review of the Wynn. I own a timeshare in Las Vegas but I was unable to book a reservation as I the dates were not available. I decided to stay at the Wynn. This was my sister’s first trip to Las Vegas and I wanted to impress her. The Wynn did not disappoint! While there are a couple of things I did not care for, our overall experience was amazing. The Wynn works hard to make your stay a great one. We felt pampered and we did not stay in a suite or do any heavy gambling! Shocked by the quality of the toilet. Would it kill them to install a Japanese-style electronic bidet?